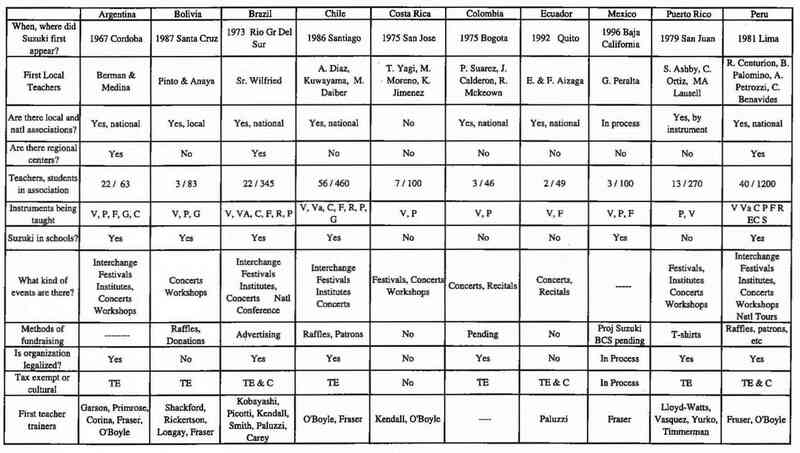 The table below is a compilation of information gathered from questionnaires sent to numerous Latin American Suzuki programs in May, 1997. The response was overwhelming! I am very grateful to all who participated in this survey. The results give a clear picture of the Suzuki programs in Latin America and provide guidance to help the SAA better serve and represent the Suzuki education throughout Latin America. The countries which participated in the survey were Argentina, Bolivia, Brazil, Chile, Colombia, Costa Rica, Ecuador, Mexico, Peru, and Puerto Rico. Translated materials, available from a central location. My apologies to any existing programs not included in the survey. We hope that Latin American teachers will let us know if there is information missing from this survey. If state, provincial or local programs would like to help with any of these projects in Latin America, there are many possible ways to become involved. June 13-18, Santa Cruz, Bolivia: lA philosophy, Piano IB, Piano Book 2. Caroline Fraser, Marilyn O’Boyle, Roberta Centurion. June 19- 27, Cordoba, Argentina lA philosophy, Violin Book 2, Piano Book 2. Fraser, O’Boyle. September, Panama City, Panama: Violin Overview workshop. Ronda Cole. November 26-30, La Paz, Baja California, Mexico: Piano lB. Fraser. January 5-9, Lima, Peru: lA philosophy, IB/2, advanced pedagogy (piano and violin), guitar, recorder. Fraser, O’Boyle, Dee Martz, Doris Koppelman, Alan Johnston, Roberta Centurion, Lucia Nieto. Note: Colegio Franklin Delano Roosevelt, Lima, Peru is so impressed by its Suzuki Violin program which was founded in 1981, that beginning in 1987, the school is awarding the Suzuki Association of Peru an annual stipend to help bring an SAA Teacher Trainer to the January Festival. January 11-15, Santiago, Chile: lA philosophy, lB, advanced pedagogy (piano and violin), cello. Fraser, 0′,Boyle, Dee Martz, Doris Koppelman, Tanya Carey, Roberta Centurion. Also being planned for 1998: courses in Argentina, Bolivia, Brazil, Colombia, Ecuador. If you need further information about teacher training courses taking place in Latin America, or if you have further information you would like included in the next Journal, please contact Caroline. The SAA will once again offer scholarships for Latin American teacher participants at Summer Institutes. The application deadline is March 1, 1997. 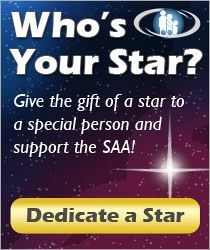 For more information, please contact the SAA office. Holy Names College in Oakland, California is offering a Latin American Piano Scholarship for the 1998 HNC Summer Teacher Training Institute. This is a $1200 full tuition waiver for the 3 week program which takes place from July 6-24. Spanish interpreters are available. Previous recipients are Elba Jimenez, Peru, and Clara Sierocinski, Argentina. For further information contact Caroline. Greater Washington Suzuki Institute, held at the Catholic University of America offers full tuition scholarships for teachers from Haiti. For information contact Ronda Cole. The overview course for violin teachers, taught in Coral Gables, Florida, offers full tuition scholarships annually to teachers from Haiti. For information, contact Laura Woodside. University of Wisconsin, Stevens Point offers tuition scholarships for Latin American teachers. For information, fax Dee Martz or phone her. East Tennessee Suzuki Flute Institute International has offered an Ecuadorian teacher full tuition scholarships or a work study position annually since 1991. The Graduate School of East Tennessee State University has offered a Brazilian teacher a full tuition remission for a Master of Music Education degree, specializing in Suzuki pedagogy. Additional performance scholarships from the Music Department and the Johnson City Symphony, combine with an SAA scholarship for long term training, to enable this teacher to finance her studies. The Suzuki Association of Peru offers teacher training courses at a very low fee, in order that all who are interested may participate. Pro-rated tuition is offered to teachers from the provinces along with room and board provided by host families. The association does its best to provide hospitality to teachers traveling from other countries. If your Institute can offer teachers tuition scholarships, assistance with travel, or room and board, please contact Marilyn O’Boyle. The Suzuki Association of Wisconsin is in contact with the Suzuki program in Santa Cruz, Bolivia, hoping to sponsor teachers to come to the Suzuki Conference in Chicago, May 1998. The Suzuki Association of Quebec is making contact with the Suzuki Association of Chile. Project Peru: Capital University in Columbus, Ohio, is holding a Suzuki Workshop on October 25th, 1997. All proceeds will go to the Suzuki Association of Peru. 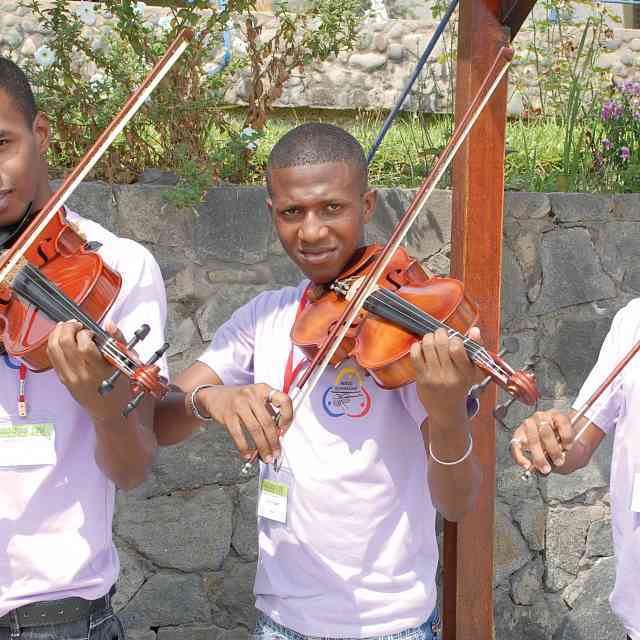 The Greater Washington Suzuki Association continues its fifteen-year relationship with the Holy Trinity School in Port-au-Prince, Haiti, trading used instruments, strings and accessories. Any group interested in this type of networking, please contact Marilyn. The Suzuki Association of Ecuador (Asociacion Suzuki del Ecuador) has recently achieved official status by ministerial decree. 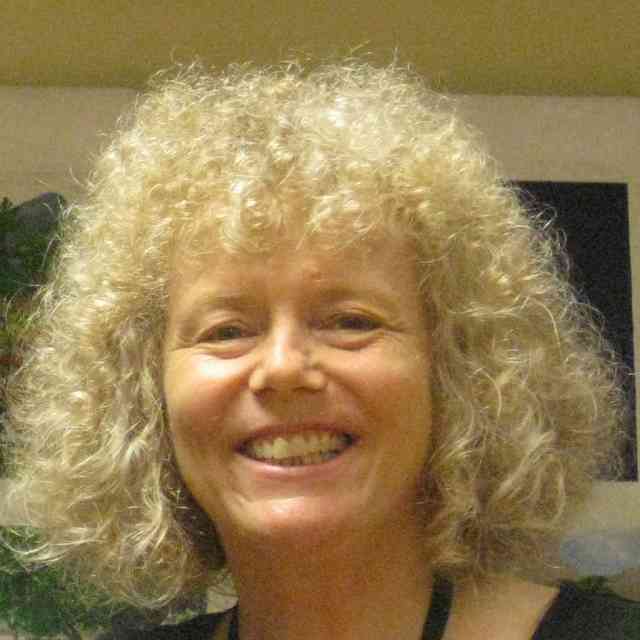 SAA Teacher Trainer Rebecca Paluzzi has been appointed to its Board of Directors. The President of the Association is Carolina Jijon. Spanish translations of selected articles from the Journal are now being prepared for distribution. If you have any materials already translated in Spanish or Portuguese, if you are interested in translating, or if you need materials which are already translated, please contact the SAA office. Any Latin American email user who wants to share information, or have news published in the Journal, please contact Caroline Fraser. Previously printed in American Suzuki Journal 26.1. Reprinted with permission. Copyright © 1997 Suzuki Association of the Americas, Inc.